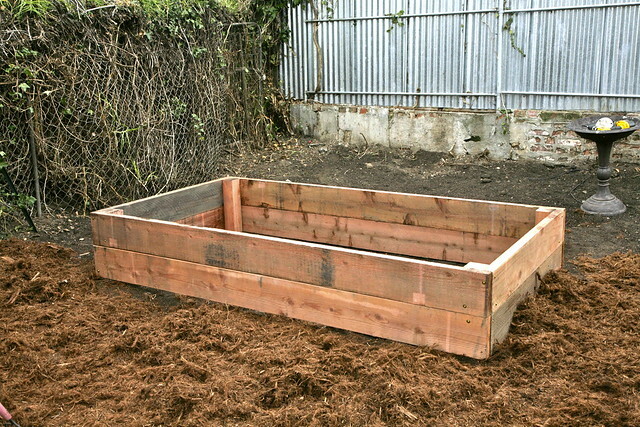 Inder Loves Folk Art: Raised beds. I'm considering renaming this blog "Inder Works On Her Backyard." 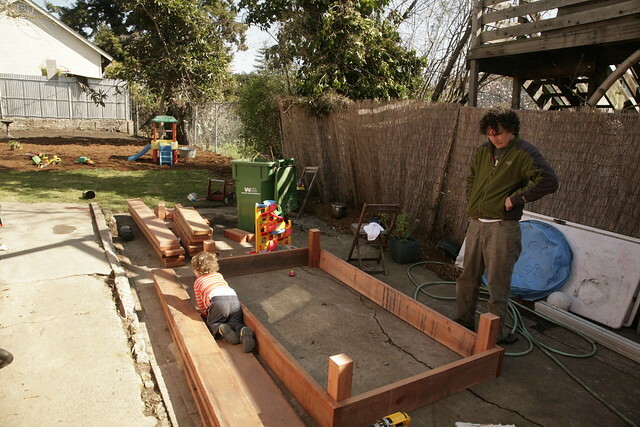 Um, so building raised beds and filling them with soil is a huge amount of work. Who knew? I can feel every muscle in my body right now ... separately. But thank goodness for three day weekends. We were able to order all of the supplies for, and then build and fill three large beds this past weekend. Joe thought the lumber was perfect for pushing trucks on. 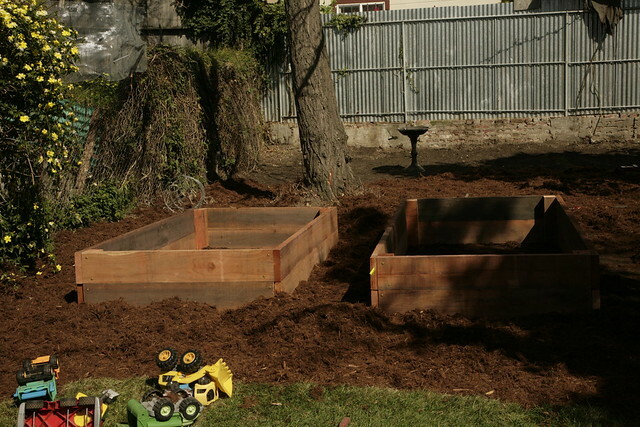 Steve and Harpal built the first two boxes, and positioned them, but then we had to dig into the slight incline in our garden to get the beds level. Beds in place but not level yet. Then we lined them with plastic, hoping that this would protect the wood for a bit longer and prevent water and dirt from seeping through the cracks. Level and lined with plastic. Then there was a long interval that I have no record of, except the memory currently imprinted in my shoulder muscles. It took ten wheel barrow loads of topsoil to fill each bed. Harpal and Steve filled up the wheel barrow and dumped the dirt, and then I tried to flatten it out (they gave the pregnant girl the comparatively "easy" job). By the end of this, we were all sweating and gasping a bit. We only had to move the topsoil from our driveway (where we got a big delivery of soil) to the backyard, but this was definitely the hardest part of the whole process. This is so much harder than it looks. 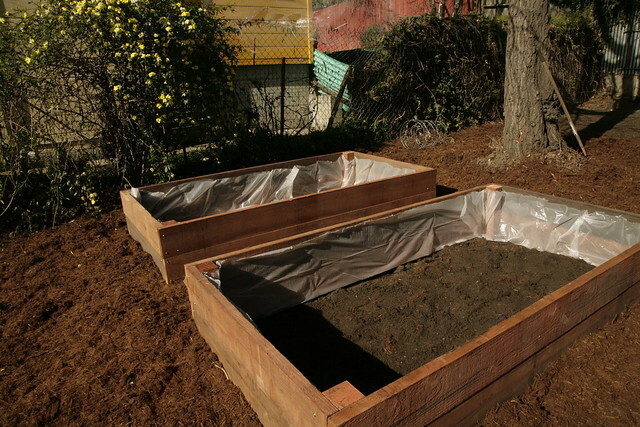 Public Service Announcement: Do not try to fill raised beds of this size (or even much smaller beds) with bags of soil from the hardware store or garden center. I can't even imagine how many bags of soil it would take and how much that would cost. 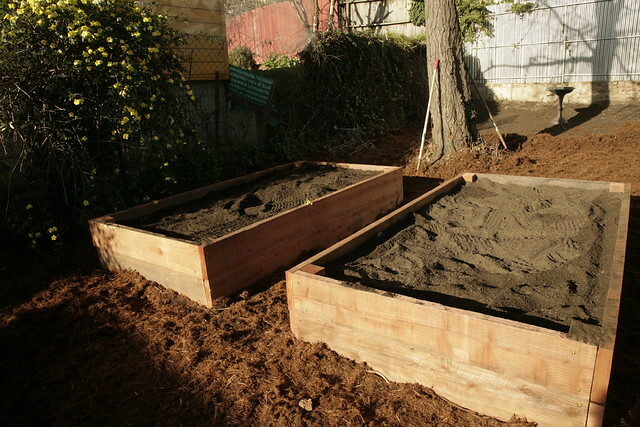 Each of these beds used about a cubic yard of topsoil. Getting the big delivery was definitely the way to go. And I hear the soil will settle a lot over the first six months or so and require even more soil to really fill it up. We're also going to add some boards to the short ends of these boxes to use as little benches to sit on while gardening or watching the kiddos. It's going to be sweet. A belly shot where you can't really see my belly. I'm a little more than 18 weeks along now. 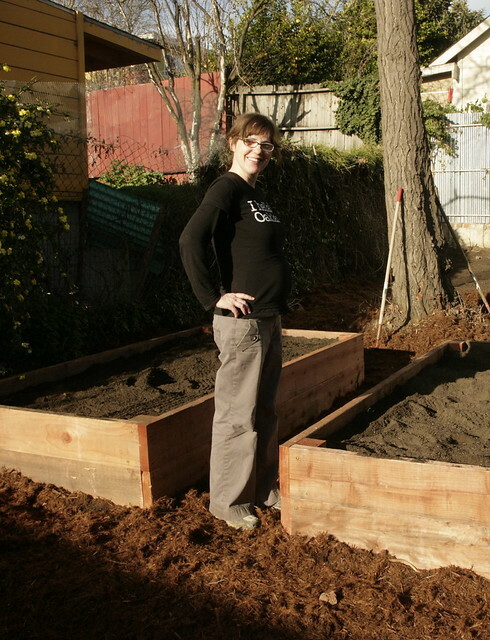 We also built and filled another bed in the very back of the garden, but at that point, I was sweating and gasping too much to bother photographing the whole process. I'm sure I'll be sharing photos of all of the beds later. The final bed, in the back of the garden. So very tired. But pleased too. 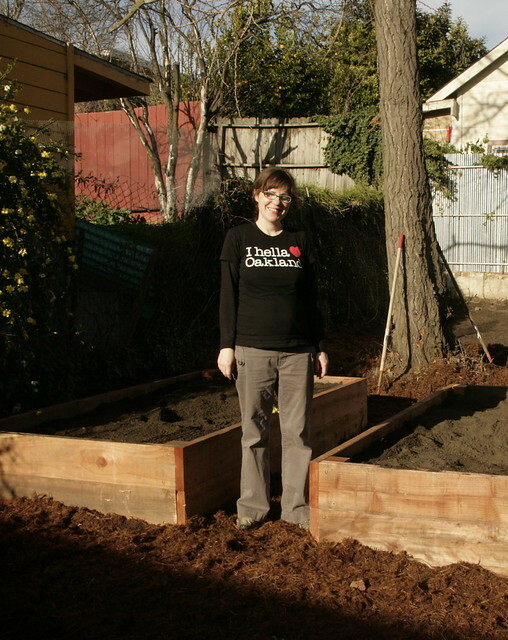 So excited for all your new veggie garden space! But crap, gardening is a lot more tiring than you think it's going to be, isn't it? Blah, why did they have to make the word verification thing so much harder just recently? I know. I hate the new word verification too! But the alternative is so. much. spam. Sigh. a) nice job on the beds! I can't wait to see what you fill them up with! b) looking adorable pregnant! working in the yard doing hardscape when pregnant is hard...we did the bulk of our garden when I was 4-5 months pregnant-- all the gravel pathways, the raised cinder block beds, etc. OUCH! This is only the second time since we've moved in (six years ago) that the police have tried to track down a fugitive on our property, so I guess that's really not too bad? Yeah. You built and filled three beds in a weekend? Um, I'm pretty sure that you guys get some sort of award! And you little belly is adorable! Ha! I just clicked the flickr link and saw the picture of the swat guy on the neighbor's roof. Just what you want to see right? Yeah, we had heavily armed guys in helmets and bullet proof vests IN OUR CRAWL SPACE that day (they asked permission, my 4th amendment rights were not violated or anything). Super awesome. Love those raised beds they really turned out nice!